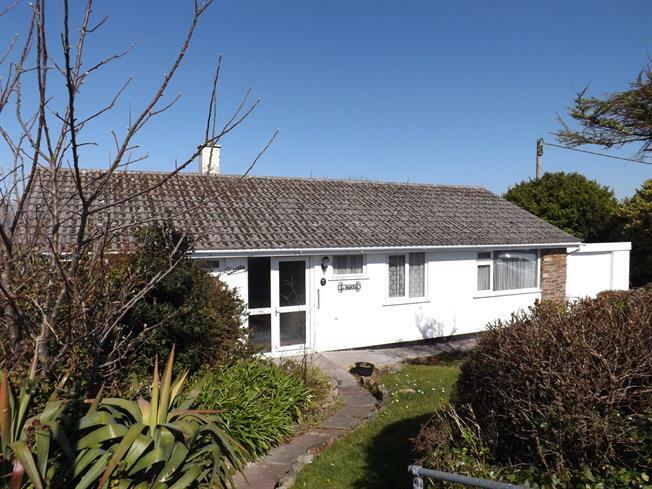 3 Bedroom Detached Bungalow For Sale in St. Ives for Asking Price £295,000. On entering the bungalow there is a Cloakroom to your right and a door to the double aspect lounge to the left. There is a kitchen to the rear with a conservatory . There are three bedrooms and a family bathroom. Outside is a detached garage and driveway with gardens to the front and rear with some sea views. Vinyl flooring with a low level Wc and pedestal sink, frosted window to the front. A single glazed conservatory with access to the rear garden. Fitted carpet with heating radiator, double glazed window to the front. Fitted carpet and heating radiator, double glazed window to the rear. Vinyl flooring with bath and pedestal sink, low level wc , mirror and shaving point. Vinyl flooring ,window to the rear with doors to the lounge, hallway and Conservatory. With a range of base and wall units and a stainless steel sink and drainer. Fitted carpet ,with two double glazed windows, one to the front and one to the rear. Heating radiator and feature fire place.